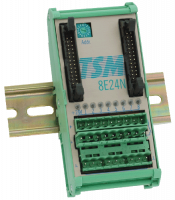 TSM-8E24N is a general purpose digital input module for switches, proximity initiators or linking to other 24V switch devices. All inputs are isolated and have low pass filters of about 500Hz. The switching threshold is about 12V. A red LED is assigned to each input. 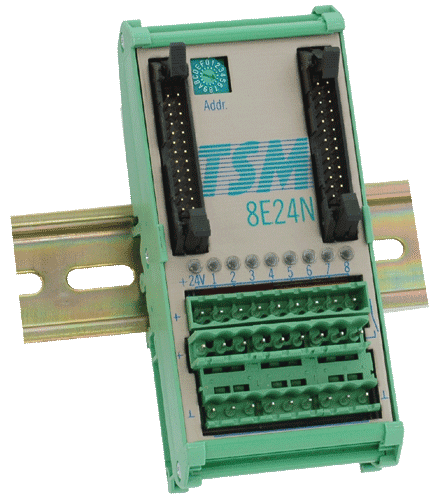 24V= are applied to the module and then distributed to the terminals for all inputs. Three connections are available for each input, 24V supply, ground and signal input. So a switch or initiator can be connected without an external wiring area. In special cases (transducers with OC-outputs that have their grounds connected) specific inputs can be disconnected from the ground rail. Beside the 8bit data word that represents the condition of the inputs it is also possible to read the module identification (OBH). Missing external voltage (24V) can be read with bit 6=1 together with the module ID. A green LED signals a present voltage.